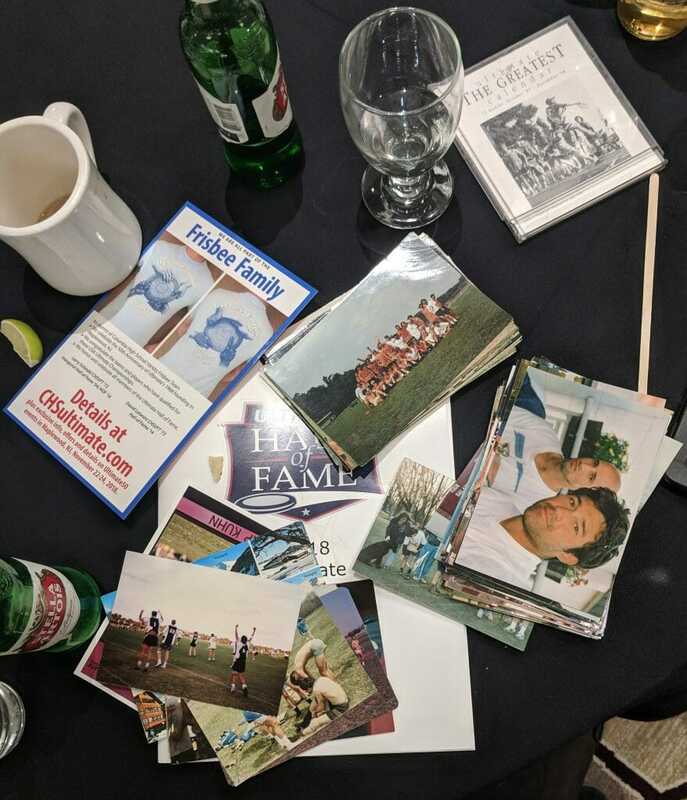 On Friday night during the 2018 National Championships, USA Ultimate hosted a dinner combining the last several years of Ultimate Hall of Fame inductions and a celebration of the 50th anniversary of ultimate’s founding. In a room filled with more historic star power than possibly any other gathering of ultimate players ever, people discussed how the sport has changed over time, what they would like to see USA Ultimate doing for the future of the community, and – of course – which city has the greatest ultimate legacy. 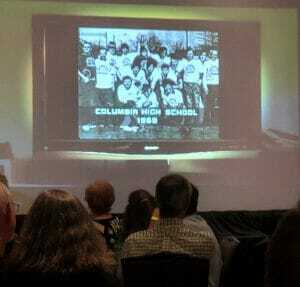 The Hall of Fame inductees this year included leaders and pioneering athletes like Tiina Booth, Skip Kuhn, Dominique Fontenette, Stu Downs, and Amy Wilbur as well as the group of ultimate players known as the Johnny Appleseeds – the original Columbia High School students who played the first recorded game of ultimate in 1968 and spread it to the world when they graduated. Considered the founders of ultimate, they shared the ceremony with former leaders of the Ultimate Players Association, USA Ultimate CEO Tom Crawford, and World Flying Disc Association President Robert “Nob” Rauch, as well as members of every storied team from New York New York to the Lady Condors. And let me tell you, they had a lot to talk about. The ceremonies took several hours and offered everything from standard speeches to an old-school video on the sport’s history to a “we are family” sing-along and, of course, a call to action and an emphasis on the importance of getting ultimate into the Olympics. Attendees watch a film about the illustrious history of the sport, starting from its beginnings in a New Jersey parking lot. The atmosphere of the dinner felt historic but not stuffy – the hundreds of attendees talked loudly during many of the attempted announcements, dressed in a huge range of formal attire, gave at least ten standing ovations, and drank heavily throughout. UltiPhotos staff attempted to wrangle everyone for class pictures as their friends heckled them while teammates reunited and shouted their old cheers. 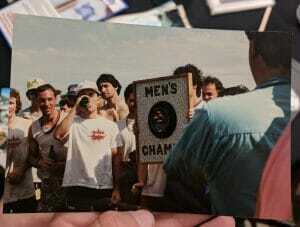 Old friends laughed over stacks of film photos, people told stories of how they met their significant others at ultimate tournaments in the 1980s or 1990s, and many yelled “travel!” at some of the plays included in the highlight reel. Every single person was clearly overjoyed to be in attendance, and USA Ultimate did an excellent job of balancing the natural goofiness of ultimate players with the intended seriousness of the occasion. Dinner began with an opening speech by Rauch, followed by a champagne toast sponsored by USA Ultimate and a speech from Wham-O’s former head of sports marketing. Next up was a video about the Hall of Fame inductees, a review of USA Ultimate’s strategic plan, and a brief introduction to the charities that USA Ultimate sponsors. In between each of these, a new class of awardees were officially and rapidly inducted so as not to lose the attention of the audience. Commemorative glasses were given out to all attendees. 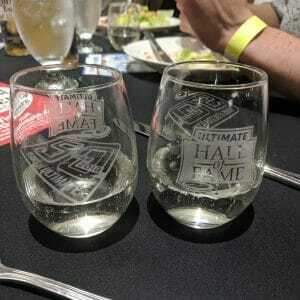 During one of the speeches, it was announced that ultimate is hoping to build a physical Hall of Fame in New Jersey within the next few years. There is currently a search committee looking for the specific location, but much of the material has been collected and is ready to be displayed. 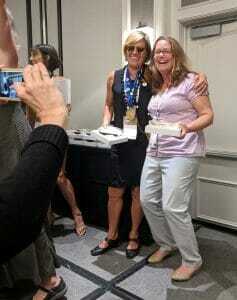 USA Ultimate also announced that they were donating a $10,000 grant to Ultimate Impact, an organization dedicated to improving the lives of children in underserved communities through mentorship and the sport of ultimate. After inducting the final class of Hall of Famers, Phil Adams discussed the activities that would be held over the following days and Rauch gave some closing remarks. Then everyone stayed and drank for another three hours. For those on the East Coast who couldn’t join in for these festivities, there will be an Ultimate50 event in Maplewood, NJ from November 22 to 24 of this year to celebrate the birthplace of ultimate. I spoke with several members of the old guard to get their opinions about the direction ultimate is moving, the ways the sport itself has changed, and what they love about the ultimate community. Here are a few of their thoughts on ultimate in 2018, edited for clarity, and with the disclaimer that many of these people had not watched a tournament in years – let alone ever played in a horizontal stack or a game to 15 points. One person asked me what city Revolver represents, another was surprised to hear that the AUDL actually had referees, and many couldn’t name a single active women’s team except for Riot. Stacks of photos were passed around among friends. Overall, this was the biggest talking point people discussed with me. Everyone thought the game looked different, but no two people fully agreed on the specific ways it had changed. I heard that people used to be more physical and that they used to be less physical. People take too many risks and people play far too conservatively. Poaching makes the game boring and that poaching was the inevitable evolution of defensive strategy. The one thing everyone agreed upon was that the level of athleticism had definitely increased, and that was a good thing. Unfortunately, with growth comes great responsibility. Kuhn says ultimate players are “driven people who work pretty hard, and that’s what I like about us. But how do we balance our uniqueness with wanting to be mainstream?” he wondered. A big part of this is Spirit of the Game, which (unsurprisingly) very few people agreed upon. Skip Kuhn and other NYNY athletes immediately after a Championship win. I asked him if he thought that level of physicality meant players were unspirited, and he said that wasn’t the case. “I was a player who welcomed that intensity,” he said. “If you were going to be intense with me then that was a motivating factor for me to be intense back. So I enjoyed the physicality, it pushed me to play harder. Other people didn’t. But players should be able to work that out and I don’t like the observers…Let the players figure out where that boundary is.” I asked him if he had seen a single time where the observers were useful, perhaps for rule clarifications, and he answered with an unequivocal no. Does this development of the observing system stem from poor spirit or just a necessary change as the level of athleticism increases? Two new Hall of Famers smile for the camera. Last but not least, it wouldn’t be a conversation with people from a previous generation without some unsolicited life advice. So I’ll pass that on to you. One of the speeches on Friday included a moment of silence to remember all of the early ultimate players who were no longer with us in 2018. The speaker was Dan “Stork” Roddick, who is considered the first person to explicitly frame Spirit of the Game as a key aspect of ultimate. He reminded the audience to please enjoy each and every moment we are out on an ultimate field because they are all truly special and you never know which one will be your last. The real meaning of Spirit of the Game, he explained, is appreciating your team, your opponents, and the sport for what they represent – a brief flash of magic that can only be experienced when you are truly in the moment and loving everyone and everything around you. It’s clear that everyone comes to ultimate with a different background and wants something different from the sport. These arguments and disagreements are now half a century old but fundamentally unchanged, and there will never be easy answers. USA Ultimate is doing the best they can to appease an incredibly diverse group of people and grow the sport at all levels, and there is no outcome in which every single person will be happy. But to most people who were present at the ceremony, the sport is moving in a positive direction. Thanks to my father, who taught me how to throw a frisbee, and, in 1980, to ending up in the ‘WUFO Central’ dorm at Williams College, I found Ultimate. Almost 40 years later, I am grateful to have the chance to formally thank the many bright minds and industrious souls that have had the vision and energy to take the game from its gritty origins to the exciting sport it is today. Along the way it has swept up both my sons, and I am thankful for that too. I came of age at a moment when women’s team sports were in their infancy. When I began playing ultimate very few of my teammates had ever been on a team prior to stepping on the ultimate field. But we were all in – seduced by an amazingly fun sport and attracted to the community of young women and men that evolved around it. We lived and breathed ultimate, practicing on glass-studded fields in New York’s Central Park and throwing a disc anywhere and everywhere. We learned how to be fiercely competitive when our upbringings told us to ‘be nice.’ We danced on the sidelines with our opponents, spilled our guts to one another on interminable car rides, did mountains of muddy laundry and left it all on the field. At that time, we were a small community of women players, with enormous spirit and great respect for one another. Over the years that community has grown tremendously but so has the spirit. The magic of ultimate continues to bewitch. I was blessed to fall under its spell, and I would do it all again in a heartbeat. 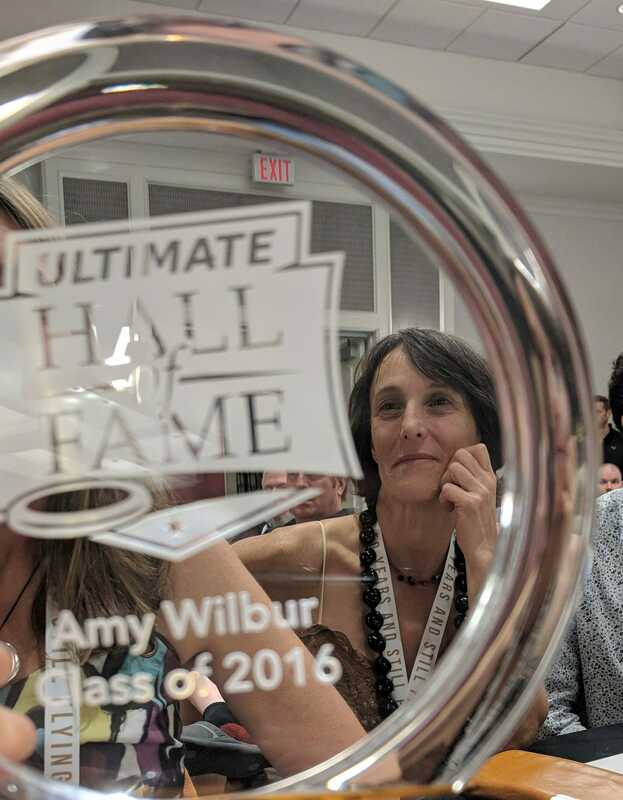 Amy “The General” Wilbur, Hall of Fame Class of 2016. Comments on "Inside the 50 Years of Ultimate Celebration: Hall of Famers, USA Ultimate’s Community Vision, and an Ever-Changing Sport"